Since the common cold is a viral infection, rather than a bacterial infection, many conventional treatments such as antibiotics won't work. Instead, you may find it beneficial to use some natural methods to relieve your symptoms and help your immune system beat the cold naturally. Ahhh – the common cold. Even the sound of it can strike fear into the most fearsome man (or woman!). These are the most frequent infections we face and can wreak havoc on even the most healthy specimen. It is estimated that over 200 types of viruses can cause the common cold. You just need a relatively small amount of one type to become ill. Viruses start by invading the tissues in the nose and back of the throat, giving rise to familiar symptoms such as runny nose, sore throats, coughing and sneezing. Touching a surface contaminated by viruses. This includes escalator rails, lift buttons, door handles and even the paper money you have in your wallet or purse. Inhaling the airborne virus after a person sneezes or coughs. Having phyiscal contact with a person who is already suffering from the cold, or touching something they have already touched. What should you do if you develop symptoms of a cold? The common cold is caused by viruses, and antibiotics will have no effect on these infective organisms. Over-the-counter medicines containing paracetemol can reduce the effects of a fever, and ibuprofen will assist with aches and pains. However, both do not deal with the root of the problem. This is the reason that Echinacea has become popular over the years when dealing with colds and flu. It works by strengthening the immune system and has also recently been found to possess direct anti-viral action. In addition, there are some simple natural or home remedies to help with the problems created by the common cold. Below are four steps you can take. A hot mug of tea or coffee is something we instinctively reach out for when feeling a bit under the weather, but did you know that there is scientific evidence to support their use when you have the cold or flu? Hydration is key and a mug of warm water will be best to help ease congestion if you are bunged up, increasing the flow of mucus. Clear Broth – Simmer vegetables and strain or, alternatively, use a vegetable stock to make a clear warming soup. Warm Lemon Water – Take half a lemon (juiced or sliced) and add to a mixture of cold and hot water. So simple and so effective. Carrot, lentil and corriander soup – This tasty vegetarian soup will also satisfy meat lovers. It is also inexpensive and remarkably easy to make. This soup is rich in Vitamin A, high in dietary fibre and also contains plenty of antioxidants. Indeed most of the ingredients can be found in your fridge or cupboard, ideal for those days when you are a bit under the weather. The added bonus is it takes less than half an hour to make! Warm Apple Juice – 2 litres of apple juice, 1 lemon rind, 2cm thinly sliced ginger, 8 cinnamon sticks and 1 green apple thinly sliced. Add all the ingredients together and heat gently. Serve with apple slice and cinnamon stick. Lemon and Honey – This is excellent if you have a dry or tickly cough. Add 1 tablespoon of lemon juice to 2 tablespoons of honey, then half cup of hot water. Add more honey or lemon as you prefer, to flavour. Echinacea is a firm favourite for treating colds and flu. Now it can be found in the form of a hot drink – A.Vogel’ s Echinaforce® Hot Drink, a great alternative to the original Echinaforce® tincture. This hot drink combines Echinacea with Elderberry to create a syrup which can be added to hot water, and can be used to stave off those aching limbs and joint pains which are an all too common problem when suffering from the cold or flu. At the other end of the temperature spectrum, cool or cold foods have been found to help ease symptoms of colds and flu. Dr James Steckelberg at The Mayo Medical School in Rochester, Minnesota recommends that ice cream or ice lollies should be eaten when suffering from the cold. Not only will these soothe the throat, but they also provide vital calories which are needed at a time of illness, when appetite is poor. This is surely great news for all the kids out there – be them big or small! This is now found in most of our kitchens but it was not that long ago that it was classed as an exotic herb. The ginger plant originates from South East Asia, and the root in particular has been used in Eastern traditional medicine, assisting in the fight against colds due to the antiviral and ‘warming’ properties that it contains. Ginger is also known to promote perspiration, which helps the body regulate temperature if you have a fever. It also is known to boost the immune system and has decongestant properties. Add ginger to soups and other dishes. It can also be made into a tea or added to other warm drinks (see hot drinks or soups section above). It is certainly a plant that Alfred Vogel would have approved of. Vitamin C is a hugely important antioxidant and is well-known for its immune system properties. It is one of our most commonly used supplements but more importantly, it can be found naturally in many fruit and vegetables that are consumed daily. Oranges, grapefruit, limes and lemons are rich in vitamin C. Vegetables such as leafy greens, broccoli and peas also contain good levels. Remember to eat or use these when they are at their freshest as the vitamin degrades as the fruit sits around in the fruit bowl or fridge. And remember not to overcook vegetables. Nature-C is A.Vogel’s vitamin C supplement. It contains natural vitamin C from a variety of fruit including prickly gooseberry and passionfruit. The benefit of using food source vitamins is that the body recognises these as being natural and this improves absorption. Of course, as with all illnesses, prevention is better than cure, so what can you do to avoid picking up bugs? Keep your kitchen worktop clean – again really just to keep the virus at bay. For more advice, read my tips for preventing colds and flu. In 2014 researchers at Aberystwyth University found that fist bumps are much more hygeinic than handshakes. The most common way of greeting someone in a business relationship or a formal introduction is by a handshake. However, by shaking hands we have the ability of transferring every germ that we have come in to contact with that day. From door handles, to toilet flushers – if a person does not clean their hands thoroughly, then bacteria is easily passed on. The researchers found that a strong handshake had the ablity to pass on the most bacteria, while a moderate handshake was still able to pass on half as many germs. A fist bump was found to transmit the fewest number of bugs at 90% less than a strong handshake. Dr Whitowrth who carried out the research believes that the fist-bump has a genuine potential to significantly reduce the spread of infectious diseases. Of course, it is impossible to avoid picking up the common cold. However, following the tips in this article and looking at how Nature can help you, you will stand a better chance of avoiding the misery of these infections and possibly avoid the worst of any illnesses. Looking for a solution to help fight off symptoms such as aching limbs and headaches when you are struck down by the cold or flu, then look no further than A.Vogel’s Echinaforce Hot Drink. To find local independent stores in your area that sell Echinaforce Hot Drink, just type your postcode below. For relieving the symptoms of colds and flu. Also in 15 & 100ml drops, 42 & 120 tabs. 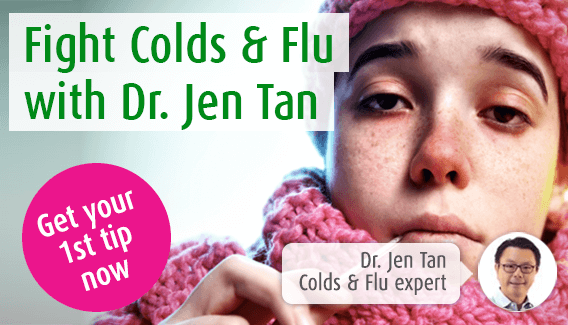 5 signs your cold is getting better7 ways you could be making your cold worseHas your child caught the back-to-school bug?Should I exercise with a cold?Is it a cold or hayfever?Summer colds vs winter coldsWhat is the difference between a cold and a flu?Sore throat? You could be on the verge of catching a summer cold!Cold Remedies - Fact or MythNasal Dryness - What You Need To KnowSummer sniffles? Beat that cold quickly!What's the difference between cold and allergy symptoms? I have had a cold for over a month, I can't seem to shift it. I drink green tea, eat healthy and exercise 5 time a week. Can head colds cause dizziness? As you'll probably already know, diet is important for a huge number of health conditions, and the common cold is one of them!